It’s summer, which means that it’s also tick season. Through their bites, these bloodsuckers pick up the bacteria that cause Lyme disease from white-footed mice and then spread those microbes to people. They do so with particular verve on the island of Nantucket, Massachusetts, where almost 40 percent of people have suffered through the rashes, fevers, and pain of Lyme. For those beleaguered islanders, Kevin Esvelt has an offer. Esvelt, an evolutionary biologist at the Massachusetts Institute of Technology, wants permission to stop Lyme disease by genetically engineering white-footed mice to vaccinate them against Lyme. He’d start by injecting captive mice with either a protein found on the Lyme bacteria, or one in the saliva of ticks. Some of those rodents would develop antibodies against these proteins, becoming immune. Esvelt would identify the genes that produce those antibodies and transfer them into the genomes of mice that haven’t encountered Lyme, using the gene-editing technique known as CRISPR. In doing so, he’d create a lineage of rodents that would be naturally vaccinated against Lyme from birth. Any tick that bites them would fall off and die. Any Lyme bacterium that infiltrates their blood would be destroyed. Esvelt could then release these mice into the wild, where they would breed with free-ranging cousins and spread their immunity. He’d want to test this first on a small, uninhabited island. If it works, he could move on to Nantucket and neighbouring Martha’s Vineyard. The innovative strategy is a testament to the power of CRISPR, but Esvelt’s really big idea isn’t about tinkering with genes. Instead, he wants to edit the scientific enterprise itself. He argues that scientists are too used to working behind closed doors, and too ineffective at anticipating the consequences of their research—and the consequences, in an age where biotechnology allows us to dramatically alter the world around us, could be catastrophic. The only solution is a kind of radical transparency, which Esvelt is practicing in Nantucket. By setting an example, he wants to change the way modern science is done so that it’s safer, more mindful of unintended consequences, and more respectful of the communities it inevitably affects. Esvelt is still years away from getting his CRISPR-based vaccine to work. But well before he started developing it, he went to Nantucket and Martha’s Vineyard, talked to residents, and attended town halls. He set up a governance plans for the residents to oversee the project, should they decide to let it go ahead. He explained his strategy, asked for opinions, and—crucially—listened to the responses. For example, he originally proposed spreading the anti-Lyme genes using a tool called a gene drive. Typically, any given gene has a 50-50 chance of being passed to the next generation. Gene drives push those odds up to almost 100 percent, allowing traits to zoom through wild populations with incredible speed. (Here’s a graphic explaining how they work.) These drives occur naturally, but in the era of CRISPR, scientists can deliberately engineer them. Thus far, they’ve only done so in laboratories, and on organisms like fruit flies and yeast. 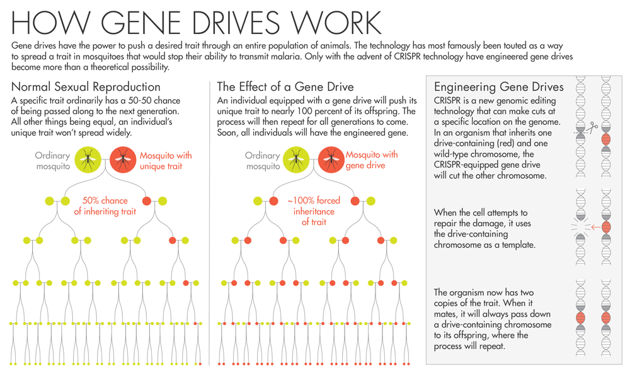 But various groups are planning to use gene drives in the wild, to render mosquitoes resistant to malaria or to control invasive rats on islands. Using a gene drive, Esvelt could ensure that his anti-Lyme genes spread very quickly through wild mice. But once such a drive is unleashed in the wild, it would spread across an entire wild population, altering white-footed mice wherever they exist. This isn’t something to be done lightly, so Esvelt has been developing ways of containing this awesome power. He can tweak the drives so that they lose steam over time, or so they can be corralled within specific regions. But no matter what he does, these drives still depend on CRISPR, and CRISPR depends on enzymes that come from bacteria. To make the drives work, Esvelt would need to add a few bacterial genes to the DNA of his engineered mice. And the citizens of Nantucket and Martha’s Vineyard weren’t comfortable with that. “They wanted the mice to be 100 percent mice,” Esvelt says. It’s a weird objection. Like all other animals, mice are already home to legions of microbes, and they have domesticated bacteria—mitochondria—in their cells, providing them with energy. But the citizens made a choice, and Esvelt respects it. “This work can only move forward if embraced by the community,” he says. “They are the ones in charge. It’s their environment.” So: no gene drive. He’ll simply let the engineered mice spread their anti-Lyme genes in the usual slow way. And what if the two islands decide not to try it at all? Instead, his team have published all their grant proposals on their website. They’re also writing their papers on the fly, in full public view. Early versions containing their concepts, ideas, and plans have been uploaded to an open server called bioRxiv, and will be updated over time as results come in. Anyone and everyone, from competitors to an interested member of the public, can see what they’re up to. Esvelt says there are many benefits to this approach. He can respond to challenges more quickly. He can find collaborators more efficiently. He’s effectively policing himself, by removing any potential for tinkering with his plans after the fact to get more exciting and publishable results. But above all else, he sees this as a moral decision. Convincing his colleagues to practice such radical transparency has not been easy. “Everyone publicly mouths words of agreement, and then nothing happens,” he says. “People say it would be lovely, but we can’t until you make everyone do it.” And to make everyone do it, Esvelt would need to change the fabric of modern science itself. He’d have to convince journals to only publish gene drive research that’s been pre-registered. He’d have to convince funders to only give people money for gene drive research on the condition that they pre-register it. He’d have to convince policy-makers to rule that all such research must be done in the open. All of these are difficult options. The one that Esvelt is most hopeful about is to, in his words, “use intellectual property as a cudgel.” If he and like-minded colleagues can pool enough gene drive patents, they can agree to license that technology out for free, as long as people pre-register their experiments and add the right safeguards. “If we can do that, the wagon will start rolling and it’ll be easier for funders, journals, and policymakers to get on board,” he says. Again, there are risks. Scientists could pre-register every half-baked idea and never follow up on them. Well-funded labs might be able to use the model to bully smaller ones. Researchers would inevitably argue about whether the person who first proposed an idea should get credit over the person who actually got it to work. But (somewhat ironically), Esvelt argues that the only way to assess these unintended consequences is to run a small-scale trial and see what happens. And gene drive research provides the ideal opportunity. If the pre-registration system works there, it could be applied to other areas of science that carry significant risks. These include geoengineering, where researchers try to manipulate the climate, or gain-of-function research in which scientists engineer viruses and microbes to be more virulent or infectious to better understand how such changes could occur in nature. All of this is necessary, Esvelt says, because he doesn’t trust scientists to reliably anticipate the consequences of their work. For example, in 2015, he was shocked to read a paper, due to be published in the leading journal Science, in which Californian researchers had inadvertently created a gene drive in fruit flies, without knowing what gene drives are. They developed it as a research tool for spreading a trait among lab populations, and had no ambitions to alter wild animals. And yet, if any of their insects had escaped, that’s what would have happened. “We’ll start with Nantucket and the Vineyard, and go all the way up to reforming all of science so we don’t destroy civilization,” he adds.